Aubrey was at the store with me the other day when I bought the supplies for this activity. She asked all.day.long when we were going to do the "marshmallow project"! When I told her it was time to start, she was so excited! I knew this activity was a hit when even my thirteen year old wanted to do it. He did make me promise not to take any pictures of him! I gave each child a pile of marshmallows and a pile of toothpicks. Let the building begin! Aubrey made a row of marshmallows to "roast"! Then, she ate them. I think this was her favorite part! I love this activity because not only is it fun but is also educational! 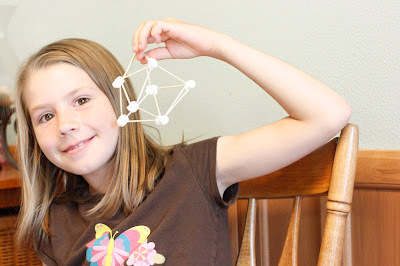 We talked about how to make basic squares or triangles and then how to connect them to make structures. Ethan explained to Isabella that if she wanted to make a skyscraper that she would need a larger base to support the high structure. I love hearing my children teach each other! This activity was a huge hit at my house and we will definitely be doing it again! Fun! Fun! And tasty, too! I love this idea and it is so simple. Great to see your kids working together to learn something. We are just starting "preschool" for our one year old and I will have to keep this in mind for when she is a little bit older. How old is your youngest? Stop by my new blog: simplehomeblessing.com, to check out our adventures in "preschool." Our youngest just turned four in April. Thanks for stopping by!